The Natural Health Perspective has perfected its own refreshing green drink recipe. Green drink stands for all the vitamin B complex that is contained in "greens", as well as all the nutrients associated with chlorophyll, such as vitamin K-1. 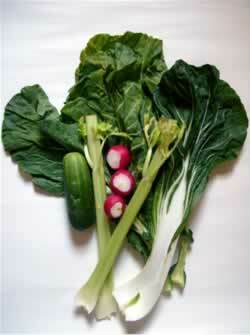 In addition, most of the non-carotene carotenoids are found in green leafy vegetables. Our green drink recipe recommends the combination one leafy green vegetable, one stalk of celery, one fat green fleshy vegetable, and a few large red radishes; per glass of green drink. It is rather hard to describe the taste of this tingling and refreshing dark green vegetable cocktail. It is neither sweet, nor bitter to the taste. It is very pleasant to the palate to drink one of these green drinks, daily. You should buy one bunch each of celery and either collard greens or bok choy. 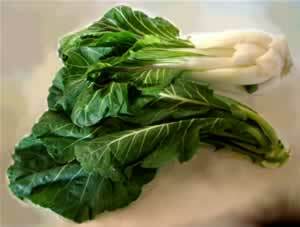 Bok choy is an Asian cabbage that resembles collard greens with thick celery like stems. A single bunch of Collard Greens can be monstrously big. The leafs of both these plants are likewise very big. However, be sure to juice their stems as well. The picture immediately to the left contains collard greens on the bottom and bok choy on the top, after being in the refrigerator for three days. These two vegetables tolerate refrigeration very well without turning yellow, or brown. After purchasing, simply air dry. Then enclose each leafy green bunch inside a double plastic bag because these plants are extra long. Seal the double bags closed with two extra long rubber bands. Collard greens and bok choy when properly wrapped can be refrigerated safely for as long as two weeks. Before juicing, simply select 3 or 4 leaves and stems and rinse off under cold running water; from either or both collard greens and bok choy. For the fat green vegetable, our recommendation is either a green pepper or cucumber. In addition, juice 3 large radishes. Immediately wash these vegetables under cold running water with a nylon brush. Then air dry. Once dry, put them inside their own plastic bag, sealed with a clothespin. Plastic wrapped Kirby cucumbers that look like pickles hold up quite well in refrigeration, whereas the more common and bigger slicing cucumbers do NOT. 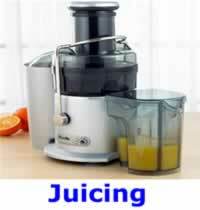 Before juicing, select a half of a long cucumber, a whole small cucumber, or a half of a large green pepper to juice. Juice the seeds and the skin as well. Inspect the radishes and cut out any bad spots with a knife. Also, be sure to juice the roots and any radish greens, if still attached. The ingredients shown in the picture to the immediate left, produced this very mug full of 15 ounces of delicious freshly juiced green drink, shown on the right. 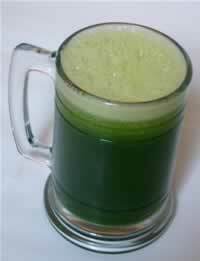 The first time you make this green drink, you are likely to over do it and end up with between 15 and 20 ounces of juice. The challenge here will be to restrain yourself from juicing too much, per glassful. This article was originally published on 12/14/2012. Please read our Links and Advertisement Disclaimer.